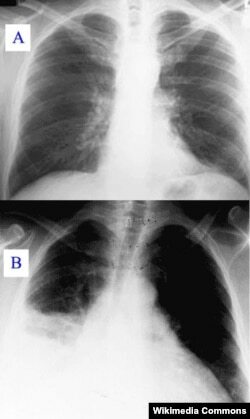 On a simple level, pneumonia is an infection of the lungs. It is treatable and preventable but was responsible for nearly one million deaths in 2015. It is the leading cause of death among children under five around the world. It is most often caused by the Streptococcus pneumoniae bacteria, but viruses like the flu, and even fungi also cause the disease. Once it gets in a person's lungs, the alveoli, or air sacs that take in oxygen, swell and fill up with fluid. This makes breathing difficult and painful, and can also limit the amount of oxygen a person takes into their body with each breath. It also causes fever, chills and coughing. Those most at risk are the very young, the elderly (over the age of 65) and anyone with a compromised immune system. Because the symptoms mimic those of the flu and the common cold, diagnosis sometimes takes a visit to a doctor, who will listen to your lungs for "crackling, bubbling, and rumbling sounds when you inhale," according to the American Lung Association (ALA). A follow up chest X-ray may also be necessary. For viral pneumonia, doctors can prescribe anti-viral medication. The disease routinely lasts 1-3 weeks in people, who are otherwise healthy. For people who get bacterial pneumonia - the most common kind - treatment for mild cases can include antibiotics, rest and fluids, and fever control. The recovery time is similar to viral pneumonia. Mycoplasma pneumoniae, another bacterial form of the illness, also called "walking pneumonia," is generally mild, but full recovery may take an extended period of time, especially for the young, elderly and unhealthy. Preventing pneumonia requires the same steps used to prevent colds and the flu. The ALA recommends an annual flu shot. In addition, "Children younger than 5, and adults 65 and older should get vaccinated against pneumococcal pneumonia." Wash your hands early and often, don't smoke and get plenty of rest and exercise. If you're the parent of young children, make sure you're up to date on all your vaccines. "There are several other vaccines that can prevent infections by bacteria and viruses that may lead to pneumonia," according to the ALA, "including pertussis, chicken pox and measles."